iconic guitar.com: Billy Gibbons - "Pearly Gates"
Billy Gibbons - "Pearly Gates"
The ZZ Top guitarist has a huge guitar collection. His 1959 Sunburst Les Paul known as "Pearly Gates" is at the heart of both his collection, and the classic ZZ Top sound. The back story is that ZZ Top gave their old 1930's Packard to a friend, Renee Thomas, to drive to L.A. for a movie audition. After landing the role, Renee jokingly called the Packard “Pearly Gates” because she figured it must have had divine powers. 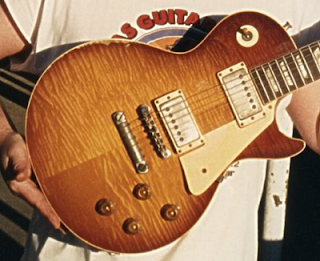 She wound up selling the car and wiring the money to Gibbons on the very day he received a call about a 1959 Sunburst Les Paul that was found under the bed of a man who had recently passed away.